Heriot-Watt MSc interpreting students have been getting a taste of the “real thing” this Thursday and will do so again next Thursday: they’re putting their interpreting skills to the test, during a live parliamentary debate at Scottish Parliament, and they’ll be practicing from the actual interpreting booths of the Scottish Parliament. Thanks to a long-standing cooperation with Holyrood, the seat of the Scottish Parliament, we’ve been able to give our 2016-2017 cohort a chance to experience a real professional booth, during an authentic event. Students are organized in small groups and split between the two main interpreting booths overlooking the main debating chamber. 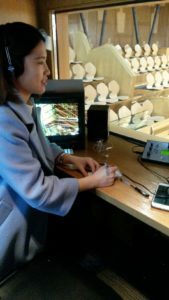 They practise live, simultaneous interpreting from interventions from the presiding officers and MSPs, under the supervision of lecturers who are also experienced conference interpreters. Of course, microphones remain switched off: it’s only practice after all, and students are half-way through their training. But this type of proper situated learning experience, set in a genuine work environment, provides students with a unique chance to test their skills and observe a number of challenges which aren’t always easy to integrate in a classroom setting. This unique interpreting training experience has been the object of a study by Chouc and Conde, and there are many benefits for students: they are confronted, in the space of 2 ½ hours, with a range of Scottish accents, but also various paces or style of expression. They also become more aware of the type of procedural jargon used in parliamentary business, observing recurring turns of phrases used to present a motion, formally adopt it or to address the various stakeholders. They encounter passionate speeches, arguments, technical terms familiar to MSPs, but which can be challenging for students who don’t use this type of terminology daily. It also puts their awareness of current and local affairs to the test, since the parliament handles a range of matters very much determined by the news, as well as issues that every community faces. But more than anything, students get a feel for the career they want to embrace: it’s a test of stamina, as they remain in the booths for the full duration of the session (over 2h). It’s also an opportunity to learn how to work in teams, as students all work in pairs or as a trio: they assist each other, discuss solutions and glossary, and gradually adopt the behaviour of professional interpreters, sitting side-by-side, and scribbling the words, acronyms, names or figures their colleagues may need. They also take it in turn to listen to their peers as pure users, thus applying their critical skills to a live performance. This is a crucial step in developing their own self-assessment and monitoring skills. 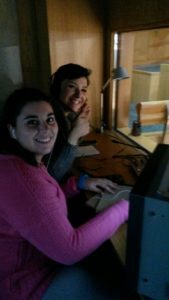 Ultimately, though, it remains an exciting and inspiring opportunity, and students leave the booths motivated, focused, and better aware of the demands of a professional interpreting assignment. And that takes them one step closer to professional booths in international institutions! 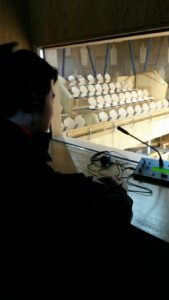 This entry was posted in Events and News, Interpreting, Research, Students, The Future, Training and tagged Interpreting, practice, Scottish Parliament, simultaneous interpreting, Students, training by Katerina Strani. Bookmark the permalink.